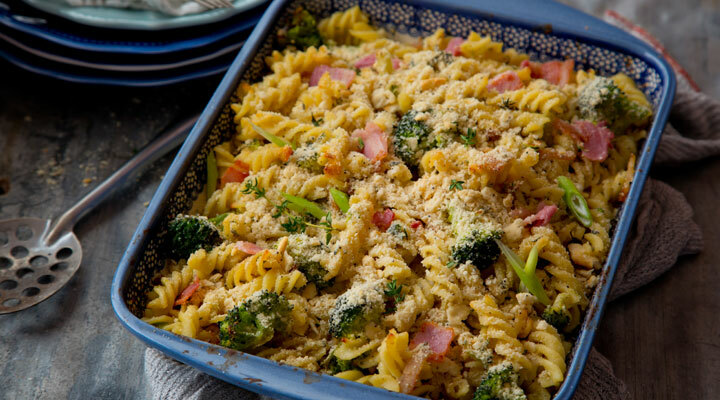 For a crunchier finish, sprinkle some panko breadcrumbs over the surface of the pasta bake, then transfer to the oven. 2. Cook the pasta in a saucepan of boiling salted water as per the packet instructions. Drain and set aside. 3. Meanwhile, heat the oil in a large pan set over a medium heat. Add the bacon and thyme and cook for 3 to 5 minutes, then add the leeks and cook for a further 2 minutes, until the leeks have softened. Sprinkle in the flour and cook for 1 minute more. Add the milk a little at a time, stirring continuously for 2 to 3 minutes, until the sauce is smooth and thick. Remove from the heat and stir in the blue cheese. Check the seasoning. 4. Bring a large saucepan of salted water to the boil. Blanch the broccoli for 2 to 3 minutes, drain and add to the blue cheese sauce. Stir in the cooked pasta, then transfer to an ovenproof dish. Bake for 20 minutes, until piping hot and lightly coloured on top. Serve immediately.